The Cumberland Island Museum, located on Georgia’s southernmost barrier island, is dedicated to furthering knowledge of the island’s natural and cultural history, and to preserving archival materials associated with the island. The nonprofit Cumberland Island Museum is located in the area known as The Subdivision on the island’s northern end. Much of the northern portion of Cumberland Island is a Wilderness Area, rich in wildlife and biological diversity. Thus the museum is uniquely positioned to observe and catalogue this ecosystem. The museum collects and archives specimens from the island and maintains a library of publications and articles. The collections and library are available for scholarly research. The museum’s book Sea Turtles of the Georgia Coast reveals the fascinating life history of sea turtles and describes many aspects of their biology. 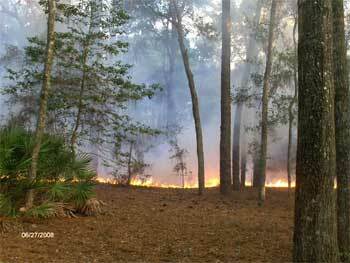 Natural fire is essential to Cumberland Island. Island ecosystems have evolved with lightning fire, which serves to maintain their integrity, especially wetlands, flatwoods (scrub), and even some areas of maritime forest. See FIRE: A Natural Part of the Island Ecosystem for an in-depth analysis. 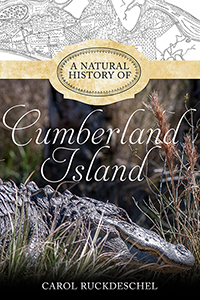 More information is available in the quarterly Cumberland Island Museum Newsletter, which you will receive with a donation. Want to support the museum and receive the newsletter? A donation of $15 or more annually is all it takes. All membership funds go directly to support the museum’s work; no salaries are paid. The island’s ecosystem is not only diverse but also evolving. 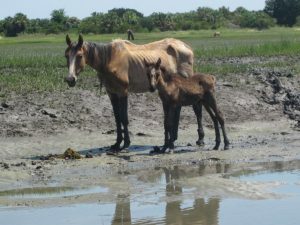 An article from the Cumberland Island Museum newsletter describes evidence of coyotes on the island. An article by Will Harlan from Blue Ridge Outdoors magazine describes efforts to preserve Cumberland’s wilderness areas—as well as efforts by some to dismantle wilderness protections. What’s Really Happening To Our Sea Turtles? The numbers of dead and stranded sea turtles continue to increase. See Strandings for more detailed information on sea turtle strandings on Cumberland Island from 1981-2005.